Smartwatches are hard. Recent numbers certainly reflect that fact. Motorola bowed out and Pebble simply evaporated. 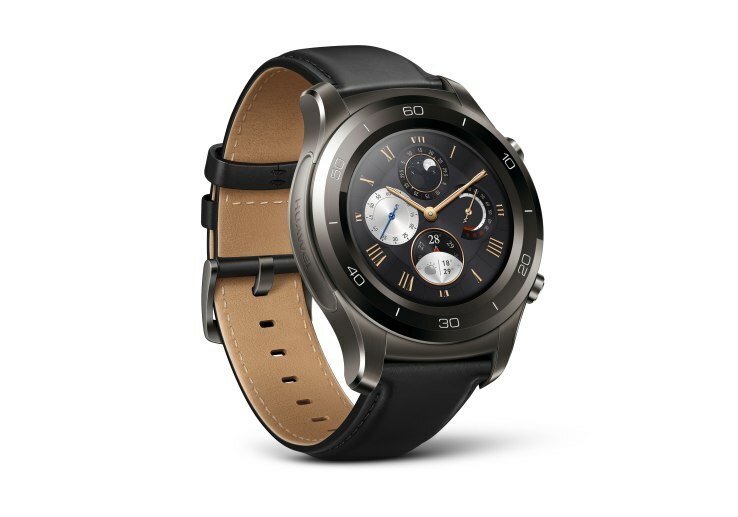 This week at Mobile World Congress, Huawei continues the good fight with the simply titled Watch 2. So, at least you know what you’re getting. On a whole, it’s a pretty straight forward proposition. The new wearable looks a lot like its predecessor, which Huawei insists has been a good seller (the company didn’t crack the top five in IDC’s end of year report, but it’s all relative). Naturally, the sequel runs Android Wear 2.0, one of the first devices to offer the long-awaited wearable OS since its launch earlier this month. It sports a pair of navigation buttons on the right side, but skips the dial altogether – a strange oversight, given the fact that the control scheme was one of the big additions to the latest version of Wear, bringing quicker navigation through the small screen’s menus and bringing Android up to speed with watchOS and Samsung’s Tizen off-shoot. What the Watch does get right is size. This has been one of the biggest sticking point with the recent slate of smartwacthes – including, most notably, Samsung’s Gear S3 and LG’s Watch Sport. 42mm cases coupled with smartwatch internals don’t make for comfortable wearables. The Watch 2, on the other hand, fit nicely on my wrist. Granted, I’m 5’11 and thus on the larger side of the human experience, but it’s certainly a step in the right direction toward making the devices more universal than the wrist-worn satellite dishes so many end up being. It’s also surprisingly light – part of that is due to the company’s decision to swap out the Sapphire screen for Gorilla Glass. Huawei admits that bringing the watch’s weight down was a driving force in the design process. The watch comes in two versions – the Watch 2 and Watch 2 Classic, both of which maintain a similar form factor, though the Classic features a metallic body. The Watch 2 also sports an LTE option, taking advantage of one of Android Wear 2.0’s biggest addition, allowing users to wear the thing untethered from their phone. Interestingly, the battery size is the same across the board – including the LTE edition. It’s 420mAh hours, just below the LG Watch Sport’s 430. Hopefully Huawei is able to make better use of it, because the battery life on LG’s latest wearables was downright dismal. Battery life does factor in pretty heavily in Huawei’s sales pitch, though. The company promises 25 days on a charge. There are some pretty massive caveats to that claim, of course – the biggest being that it’s part of a new “Watch Mode” feature, which essentially turns it into a dumb watch. From there, you can track the steps and check the time – and that’s basically it. Really, it’s like a hybrid smartwatch, without the always-on screen. It’s perhaps a handy mode for long plane rides, meetings and first dates, but otherwise activating it sort of defeats the purpose of wearing a smartwatch. Otherwise, you’re going to get about 10 hours of life with LTE and the built-in GPS enabled by Huawei’s count, assuming you’ve deactivate the screen. Aside from Watch Mode, the company’s big addition from a software perspective is a partnership with fitness company Firstbeat, which brings more advanced health monitoring and training to the device, utilizing the Watch’s constant built-in heart rate monitor. The watch straps are swappable – always a plus. The Classic uses a standard 22mm lug, so they can be switched out with third-party bands. The Watch 2’s band meanwhile, has less give, but can still be changed out. Huawei made it clear that was happy with the reception of the first generation, and as such, hasn’t messed with the formula too much. Like Android Wear 2.0, there’s not a ton new here to convince smartwatch skeptics. Watch Mode is a nice feature, but doesn’t fully address the space’s larger battery life issues. Points for making something more comfortable than much of the competition, though.